EnviroSlope Geogrid Wrap is a mechanically stabilized earth (MSE or RSS) slope system with a vegetated face. EnviroSlopeTM Geogrid Wrap is an economical system to create attractive vegetated reinforced soil slopes and is recommended for slopes up to 45 degrees. Subject to site specific design, the recommended facing material for this option is UV resistant biaxial geogrid EGRID 2020 backed by an turf reinforcement mat (Layfield TRM P-12). The zone next to the inside front face of the slope is filled with seeded topsoil during construction for vegetation growth. Uniaxial geogrid is installed during backfill as per design to support the slope at the specified angle. Reinforced slope structures are usually constructed in areas to save space. Typically the structure delivers advantages in right of way and reduced space that could not be achieved with the slope of an unreinforced embankment. Applications include highway embankment construction, landslide repair, commercial and industrial applications, decreased bridge spans, embankment construction with fine grained soils, reduced embankment footprint in sensitive areas (e.g. parks), arch culvert end treatments, and residential steepened slope structures. 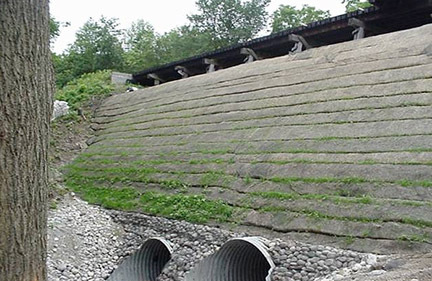 EnviroSlope System Geoweb® Face is a steepened slope that uses Geoweb for erosion protection. EnviroSlope Stacked Geoweb is a slope system with a stacked (tiered) Geoweb facing that can be readily vegetated. EnviroSlope Wire Mesh Face is a mechanically stabilized earth (MSE or RSS) slope with a wire mesh facing that can be readily vegetated. Geoweb Geocells are specialty 3-dimensional structures that may be used for slope and channel protection applications.